Strictly limited edition of 999 copies! Man versus machine. Heart versus head. Emotion versus reason. More than ever before, we are waging this war. And yet there will be no winner. Thus, ROTERSAND are not yet able to let go of these dense, dystopic and yet all too real issues. Instead, Germany’s most intelligent Electro act wants to elaborate on their strain of thoughts to articulate their worries and fears even more precisely. They return to the centre of “Capitalism TM” – only to rigorously rethink and reinvent this epic body of work. ROTERSAND have always been a diametric antithesis to todays' empty club music – ever critical, intelligent and closer to philosophy than to working off all those scene related clichés. That’s exactly what makes the sister release to “Capitalism TM”, “Hey You” so strong. So furious. Alongside an armada of close colleagues ROTERSAND rework that hybrid of an Electro colossus with fierce dedication and a clear vision. High quality face lifting, that is what they have done to their songs. 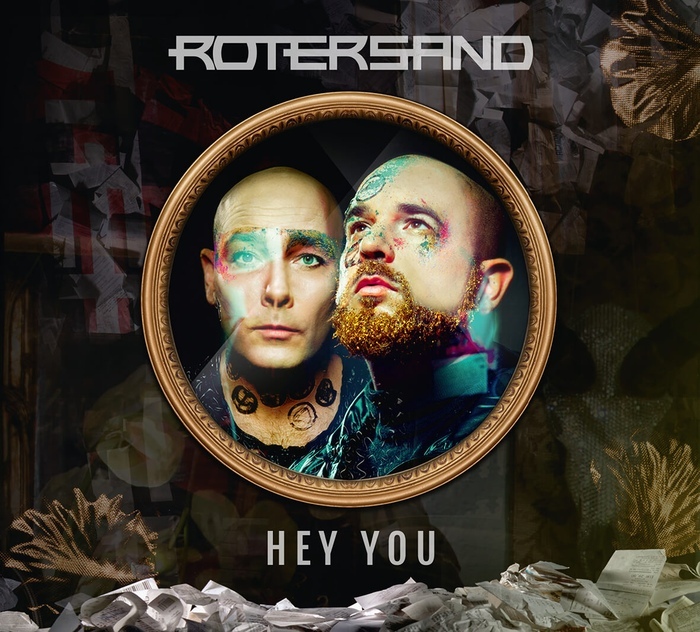 Their own reworked versions of “Hey You” or “Not Alone” boldly defragment the tracks only to reassemble them again with cunning, precision and zeal. This is so much more than a remix. It’s a completely new perspective on some of the most sublime moments in recent Electro history. What’s making this remix album even more special is the somnambulistic certainty with which all the other acts and artists interlace the original aura of this seminal record into their versions. Melodies between desperate hope, cynical realism and a profound melancholy, choruses to kill for and an entire arsenal of potential club bangers dominate the original body of work as well as this revamped album, underlying more that anything what stellar level the songwriting qualities of Krischan Wesenberg and Rascal Hueppe have reached by now. ASSEMBLAGE 23, MEHR LICHT, CONSUMER JUNKIE or CHRIS COUNT explore the periphery of the electronic world and add to this dense, holistic sound universe their own attitude and fingerprint. Electronic music, yet made by humans. Artificial worlds, yet brimming with life. This is also what sets “Hey You” apart, thus for now closing the “Capitalism TM” cycle. Its melodies, arrangements and messages, however, will continue to spread through the ether.